In December 2016, the City of Portland approved a mandatory citywide inclusionary zoning (IZ) policy, which went into effect February 1st of this year. Many developers made sure to submit projects to the city prior to that deadline; January experienced a notable rush of permit requests. Since February, permit activity has dropped off a cliff. During the first year of the program the city has received only one new land use application and 12 building permit applications for market-rate apartment projects with more than 20 units. The city is working to determine if the drop off is a result of the new policy or due to other factors. Portland’s IZ program applies to all developments with 20 or more dwelling units. It requires 20% of units be set aside for households making less than 80% median family income ($58,650 for a family of four). Incentives offered by the city to offset the costs include a 10-year property tax exemption and CET exemption on affordable units, and a density bonus of 3.0 Floor Area Ratio. Developers can also choose to set aside 10% of a building’s units for families making 60% of medium family income in exchange for additional incentives. College dorms, nursing homes, and similar group living facilities are exempt from the inclusionary zoning requirement, if they have a shared kitchen facility. Permit applications skyrocketed in the months prior to implementation but have since fallen off a cliff. In December and January of 2017 alone, the city’s developers applied for permits for 5,900 units. Since the inclusionary zoning law went into effect, only one new market rate project with over 20 units have been submitted for land use review – a 60 unit building in the Overlook neighborhood in North Portland. Meanwhile, only 12 projects with a total of 682 units have submitted building permit applications in the first full year that the law has been in effect. Between 2013 and 2017, the city built 3,000-6,000 new housing units per year. As Portland’s rent growth has begun to slow at the higher end, the city needs to continue to bring thousands of units online each year to meet the demand. If development activity continues to slow down, the city will likely find itself amid another housing shortage. According to the Portland Tribune, the Central City of Portland is expected to see a population increase of about 37,500 people by 2035. A drop off in development activity at a time when vacancy rates are still relatively low could only make the housing shortage worse. When the IZ requirement went into effect, developers expressed concern that their projects would not pencil out despite the incentives offered by the city. A massive labor shortage in the construction industry has led to increased costs and expanded timelines for development projects. During the recession, many construction companies went out of business. By some estimates, there is a shortage of 10,000 construction-related contractors in Oregon. Other factors adding to project costs are rising interest rates and Portland’s 1% construction excise tax, which went into effect in 2016. These factors raise the cost of apartment construction before the required subsidized units are factored in. Prior to the law taking effect, Kurt Creager – former director of the Portland Housing Bureau -- stated that he expected developers to be able to absorb the cost of affordable units if they achieved the highest possible rents in their market rate units. With rent growth beginning to flatten, developers, investors and banks are wary of this assumption. Last fall, the Bureau of Planning and Sustainability (BPS) recently released its 6-month review of the IZ program. BPS struck an optimistic note in their report, pointing out that the 19,000 units currently in the pipeline represent a four-year supply of new housing. They also note no increase in developers submitting 15- to19-unit projects for parcels that could support higher densities. Tyler Bump, the senior economic planner for BPS, said he will not worry about diminished supply unless the pipeline falls below 10,000 units. However, only 5,000 of the 19,000 units in the pipeline have received building permits. It is likely that not all the projects will be built, especially with a growing shortage of skilled construction labor. Material costs have also been increased alongside the cost of labor, raising the possibility that some projects submitted before February will no longer be feasible if the city’s approval process takes longer than expected. Behind the scenes, the city now appears to realize that inclusionary zoning will not produce the anticipated affordable units. They are acutely aware that the 19,000 units vested prior to February would produce 3,000-4,000 affordable units if they were subject to IZ requirements. According to the Daily Journal of Commerce, the Housing Bureau is working on a program that would allow projects vested prior to IZ taking effect to apply for a 10-year property tax exemption in exchange for opting in to inclusionary housing. The program would be capped at $50 million over a 10- year period. 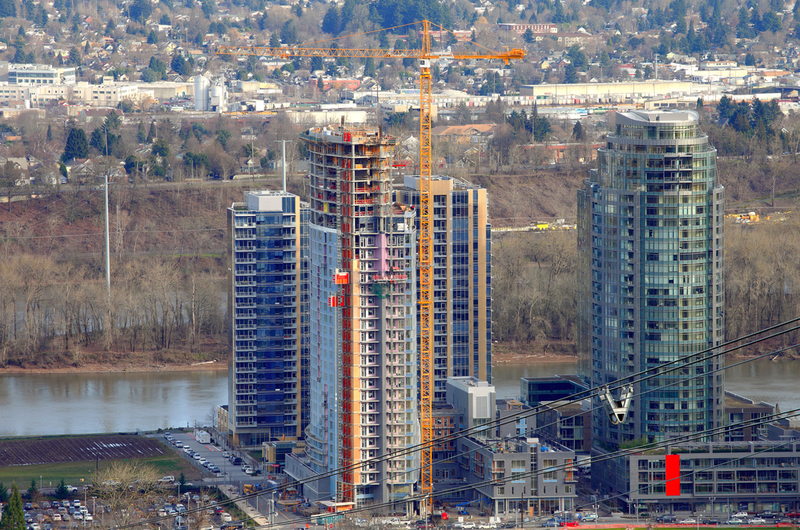 The Portland Mercury also reports that Mayor Wheeler is considering introducing additional incentives such as height and density bonuses for developers in order to increase the production of new units. He is especially concerned with the lack of activity in the city’s central core – none of the 12 properties currently subject to the IZ laws is located west of the Willamette River. The construction of affordable units under Portland’s IZ program depends on the willingness of developers to build projects in the city. The city is reliant on private developers to invest in a market with substantial barriers that make construction projects costlier than they would be elsewhere. If developers begin to look less favorably on Portland, we will fail—not only in our goal of providing affordable units, but to provide any units at all. As in-migration trends remain strong, it will be wise for citizens and the City Council to continue our examination of the impact of this policy on multifamily construction in Portland and to remain involved in the process.